Easy to use, Lightweight, Compact! My friend and I had our first outdoor event experience, this tent was light and easy to use (for two ladies) and looked great with our products. 4 side walls, 2 with windows and 2 with centre zips made it easy to create air flow, as it's Summer right now. At the end of the day, SO easy to take-down. Particularly after a 13 hour festival day! I am glad we invested. I know there are cheaper and more expensive versions. But for presentation, value and use, 5 stars for sure! Compact and easy to assemble and take down. I tested the set up and take down for this item which worked perfectly and looks great. I have not had it up for an event yet so cant comment on the material and durability. Seems like a good deal for price. I purchased it for outdoor family events where there is a chance of rain. I am aware that it is not a heavy duty outdoor tent but am hopeful it will stand up to the test. Very prompt delivery. Great canopy, terrible carry bag. Good value. 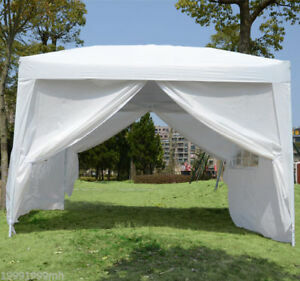 Set it up in minutes and can tolerate a good breeze (without walls). I find the push-buttons on the legs are consistently being lost inside their holes. The carry bag is less than adequate; three weeks later the bag's zipper is broken. It will meet my needs. Material is light weight but built well. Simple to erect and take down. measurements are too tight. walls dont fit properly!